Charlotte Adams, independent choreographer and artistic director for Charlotte Adams and Dancers, established the company in 2001. The group of six to eight dancers works on a project-to-project basis performing Adams' work exclusively. The company was first produced at New York's Joyce SoHo in 2001 and again in 2003 and 2006. Performing projects include an invitation by the city of Tucson for their outdoor performance series at the The DeMeester Theater, a shared concert of work at Creighton University with the Omaha Modern Dance collective, and performances with New ARTiculations Dance in Tucson, The Asheville Contemporary Dance Theatre in North Carolina, the White Wave DUMBO Dance Festival and Triskelion CollabFest in NY among others. Notable projects include a collaboration with colleague Jennifer Kayle entitled Virtually Yours, presented by the prestigious El Museo Centro Leon in Santiago, Dominican Republic and Highways Performance Space in Los Angeles in 2010, an invitation to perform at The University of Puerto Rico, San Juan, PR with the Dance Knots Project in 2013, a return to Highways in LA for the production of GUSH in May 2015, and the Breaking Ground Festival 2017 in Phoenix. Years ago, when the internationally acclaimed dancer, choreographer, scholar and teacher Simone Ferro agreed to chair UW-Milwaukee’s dance program, she would sometimes lie on the studio floor after the students had gone to feel the energy of the youngsters whose hope for lives in art gave meaning to her new desk job. Last weekend, Ferro herself danced again, filling the studio theater with mature artistry in an unforgettable, quite probably historic concert of solos by six women in their fifth and sixth decades of life. Dancing on the Ceiling, conceived and produced by Ferro, also included solos by Milwaukee’s Debra Loewen, Madison’s Li Chiao-Ping, Pittsburgh’s Beth Corning, Charlotte Adams of the University of Iowa and Sara Hook of the University of Illinois-Urbana Champaign. All have significant international credits and enormous stage presence. Milwaukee is the second stop on a planned national tour. To quiet traffic sounds in quiet light, Ferro’s heart-driven solo was composed by one of those former aspiring UWM students, Mauriah Kraker, who became a leading member of Loewen’s Wild Space Dance Company and now studies with Hook toward a masters in fine art. An explorer and traveler, Ferro seemed to carefully intuit her way across some new ground to a next stage of life, perhaps. The remaining solos were self-choreographed. Loewen presented a drawing of Heisenberg’s Uncertainty Principle, clipped her hair, let the strands fall and explained the formula as a “fuzziness” regarding place and behavior. Then she danced, beautifully, a full range of movement possibilities, and I saw in her the great women of modern dance. She was eventually joined by sax virtuoso David Collins, a longtime collaborator whose presence underlined her own dance history. Through virtuosic clowning, Corning showed us generations of her family—voluble, fragile and vividly alive around a dinner table. We also saw her loss; these folks are gone. We saw her dead, too; the tablecloth became her shroud. Then, no, she’s vibrantly alive, and they are living in her. Hook became a woman trying to be everything required of a woman and an artist until doing so became too damaging. With amazing strength and flexibility, Li took us from astonishment to astonishment against her recorded voice reciting an encyclopedic list of words and imperatives starting with “be.” Adams danced naked on the rim of a bathtub, her middle-aged body lithe and graceful. She was glamorous, self-possessed, funny, natural, enjoying the time and, it seemed, needing no more. Not just dancers but all older women, Ferro said afterwards, are made invisible. This show is a fabulous protest. 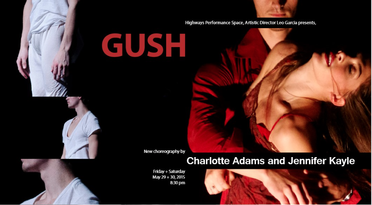 LOS ANGELES, CA – Highways Performance Space presents GUSH, 5 new contemporary dance works by independent choreographers Charlotte Adams and Jennifer Kayle on Friday, May 29, 2015 and Saturday, May 30, 2015. Kayle probes the realm of mortal passion, and the new era of human impact on the earth. Adams uncovers the body’s anatomy and its undoing, and the ludicrous toiling for success. Five works immerse viewers in the distinctly visceral performance of eleven dancers and two musicians. The pieces include original music by composer Jason Palamara, and original video by Alex Bush and Tori Lawrence. The two-hour event starts at 8:30pm at Highways Performance Space (18th Street Arts Center, 1651 18th Street, Santa Monica, CA 90404). General admission tickets are $20 in advance ($15 for students, Highways members, and seniors) and can be purchased in online at www.highwaysperformancespace.org. Reservations may also be made by calling 310-315-1459. Additional information is available on the Highways Performance Space website. Saturday October 17th, New York City - The Collaborations in Dance Festival is a celebration of movement-based performance developed through striking collaboration with artists working in other media including film, sound, costuming, visual art, and more.